I admit it, I worry. 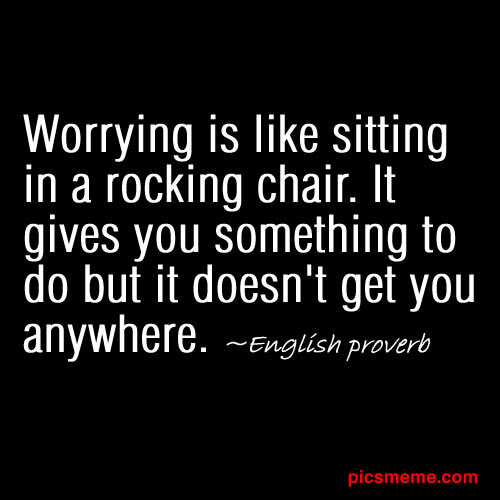 I may even call myself a worry wart. Over the years, I have worried over some pretty silly things. Did it matter that my daughter wanted to wear a pink dress up tutu for 5 straight days everywhere? Hmmmm….no. Did my son with the 104 degree temperature have a rare childhood disease? No. Did I really think he did? Not really, but was the thought in my mind….yes. Have my children ever contracted a disease because my home was dirty? Nope. Have I worried about dust and dirt in the house? Unfortunately, yes. Did grounding my daughter from a dance upset her to the point that she hated me? Yep. Does she love me now? Yep. Did she love me 48 hours after the dance? Yep. Did it matter that my toddler son hated vegetables? Is he healthy at 19? Does he like them now?….I suppose it mattered, he is healthy and no he still does not love vegetables. Am I a bad Mom because of that…NO! Over the years I have gotten better with my worry, but I still battle with worry thoughts that don’t really matter. I think most parents harbor worries about their children that simply aren’t worth the space they take up in their brain. There is a study that states only 15% of what we worry about actually ever occurs. I love a quote from Mark Twain, “My life has been filled with calamities, some of which actually happened.” Our worries so often are about calamities that will never happen, but somehow worrying gives us a feeling that we have control over the uncontrollable. The worry about what people thought of my mothering when my daughter was wearing the pink tutu complete with a plastic pink headband for 5 days was really out of my control. People think what they think! The worrying about a rare childhood disease will not PREVENT it from happening…it only increases anxiety. Worry solves nothing. With the media broadcasting about bullying, childhood health issues, obesity, evils of the internet, kidnapping, drug use, accidents….the list goes on, how can any responsible parent relax and not worry??? Worry is only effective if it results in a plan of action. Once you have a plan, put the worry to rest. If the worry is not worth a plan of action (the pink tutu) then put it to rest. If your worry does not result in a plan, then it only serves to bring anxiety, generate more concern, and possibly create tension or anxiety in your child. Worry is contagious. Chronic worry can send a message to your child that you believe that only the worst will happen in life, and that life is full of treachery. 1. Worry well. We will all worry…so do it well. Look at your thoughts and determine if this worry is one to take action on. If so, then make a plan…even write it down. Then, put the worry to bed. 2. Remove the extreme, concentrate on the positive. Ask yourself what is the worst thing that could happen? If it does happen, what will you do? Most of the time, if we are honest, the worst case scenario is still one we can manage. 3. Be real…is this worth the worry? If the worry is one that chances are will never happen….then remove it from your mind. Most of our worries are statistically not worth the worry. Although always tragic, the biggest worries parents have about serious diseases, kidnapping, school shootings, and abuse; statistics tell us those worries should not be at the top of our list. According to statistics, worries about car accidents, head injuries, water accidents should be at or near the top of our list; and those worries can be largely prevented. Studies show us that if we buckle our child up in a car seat correctly, teach our older children to use seat belts consistently, teach our children to always wear a helmet when riding bikes, skateboards, and scooters, teach basic water safety and never leave our child unattended near or in a body of water then we have greatly reduced, some experts say by 70-90 percent, the most prevalent causes of death and severe injury for our children. Those worries now can come off our list. So, although worry is a natural part of parenthood and more of a challenge for some of us, it can be controlled and a large part of it eliminated. I know that I am much happier when my worry list is small. Worry robs me of time and energy to enjoy where I am presently. As we start the weekend, commit to only worrying if it is worthwhile; meaning you can actually control the situation and do something to prevent the problem. Write your worries down and see if they really make sense. Then take a deep breath, pour yourself a cup of something relaxing (Tea? In my case, I may opt for a glass of wine!) put a helmet on your child, don’t worry about the pink tutu and enjoy. Love this articly, Cindy! Thanks for your wisdom!